The 132nd Battle of the Blues cricket encounter between Royal College and S. Thomas' College ended in an exciting draw at SSC grounds yesterday. S.Thomas' chasing Royal's challenging victory target of 268 in 54 overs, made a bold reply scoring 234 for 4 when bad light stopped play after 41 overs on the third and final day of their annual cricket encounter which had a nail-biting finish. Resuming the final day at their overnight second innings total of 99 for one, Royal went on to make a commanding 314 for 5 before skipper Ramith Rambukwella made a sporty declaration and set the Thomians a challenging victory target. Skipper Rambukwella who resumed from his overnight score of 53 went on to make 79, his second successive half century of the match, before he was bowled by his vis-à-vis Chamod Pathirana, attempting to drive on the leg side. His Sri Lanka Under-19 partner Bhanuka Rajapaksa made a quick fire 30 but the most productive contributions towards the Royal innings came from Imal Liyanage and Heshan Kumarasiri. the coveted award from Ranil Pieris, Chairman of the match organizing committee. Fresher Kumarasiri made an unbeaten 60, during which he completed that magical milestone of 1,000 runs this season. Kumarasiri and Liyanage put on 113 runs for fifth wicket, punishing the Thomian bolwers to all parts of the picturesque SSC grounds. The other most productive partnership in the Royal innings was 95 runs for the second wicket between skipper Rambukwella and Waruna Subasinghe for the second wicket. Royal captain went on to complete twin half centuries following his majestic knock of 165 in last year's big match to win back to back Man of the match awards at the Battle of the Blues, perhaps the first by a captain. Thomian skipper Chamod Pathirana followed his five-wicket haul in Royal first innings with another disciplined spell of 3 for 85. Royal were 180 for 4 in their second innings at one stage after the dismissal of Rajapakse, a lead of only 133 runs with six second innings wickets in hand. But Liyanage and Kumarasiri played two responsible innings to enable Royal setting a challenging total at the end. S. Thomas' got off to a solid start in their run chase with a half century opening stand between Asiri Wickremanayake and Javed Bongso. They took tea at 41 for no loss and were separated after the break when attempting to accelerate scoring. Nuwan Kavinda (67 runs off 47 balls with eight fours) and wicket keeper bat Sachin Peiris (77 not out off 85 balls with eight fours) frustrated Royal bowlers in a 126-run alliance for the third wicket which brought Thomians closer to the victory target. But the dismissal of Kavinda, caught at deep third man off Rajapaksa with the total on 193, became the turning point in fading light as the Thomians finally settled for a draw, despite the sporty declaration by Royal. 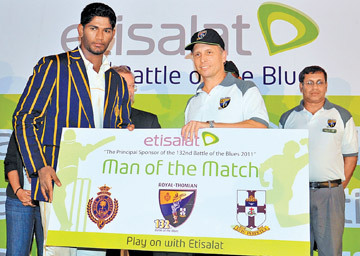 Man of the Match: Ramith Rambukwella (Royal). Fall of wickets: 32, 127, 149, 180, 293. Ravichandrakumar 7-1-42-0, Nuwan Kavinda 2-0-11-1. Fall of wickets: 51, 67, 193, 214.